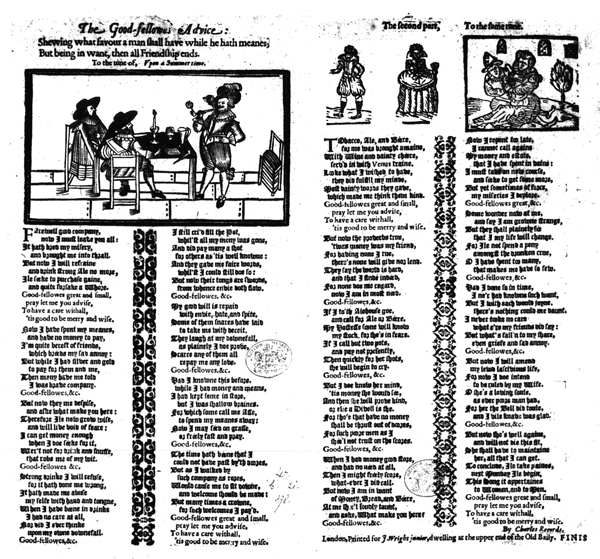 Ballad sheet facsimiles are digital approximations of what the printed ballads would have looked like when they originally came off the press. They are created by the EBBA Team in Adobe Photoshop from raw, high-quality TIFFs. Usually, the ballads have been trimmed; often, collectors also cut them apart and pasted each part onto a separate album page (see Images and Album Facsimiles). When a ballad sheet has been trimmed, we recreate an outer border. For the cut-apart ballads, we also put the two parts of the ballad back together and, where necessary, provide an inner margin dividing the two parts. In determining the size of the borders and inner margins, we surveyed 23 uncut, two-part ballads: 10 from the Pepys ballads and 13 from the Wood ballads (Wood 401) at the Bodleian Library. What we found was that both outer margins and inner divides between two-part ballads varied enormously. The space between the two parts of the uncut ballads, for instance, could be as small as 2 mm and as large as 51 mm. Given the wide range of variation, we decided on an artificial standard for the outer margin of 10 mm and for the inner margin (or divide between two parts) of 20 mm. These proportions were chosen in order to give the viewer a sense of the ballad as an independent, whole sheet without creating too much white space when the ballad is viewed in large sizes in EBBA. For cut-apart ballads that retain at least 10 mm of space on all margins, we have simply put the parts together. For the Pepys and Roxburghe Collections, we have created our album facsimiles from black-and-white microfilm images; the album facsimiles of all other collections have been created using color photographs.